As is so often the case in motorsports, the power generated by Yamaha’s four-cylinder TZ750 racing machines far outstripped their relatively primitive handling. 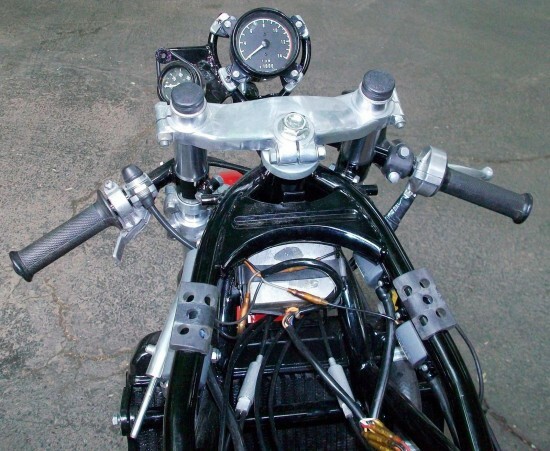 Putting the 140hp of a modern sportbike into a twin-shock, spindly-framed motorcycle with bicycle-skinny tires was a test of the most skilled reflexes and, combined with the vicious powerband of a two-stroke, made these professional-grade motorcycles in every way. This was the bike to beat during the 1970’s and even newer bikes from Kawasaki and Suzuki couldn’t reliably compete with the TZ. Powerful, reliable, and eventually even nimble, the TZ750 was ridden by men brave enough to hang on while the Yammie dragged them, kicking and screaming, to victory. 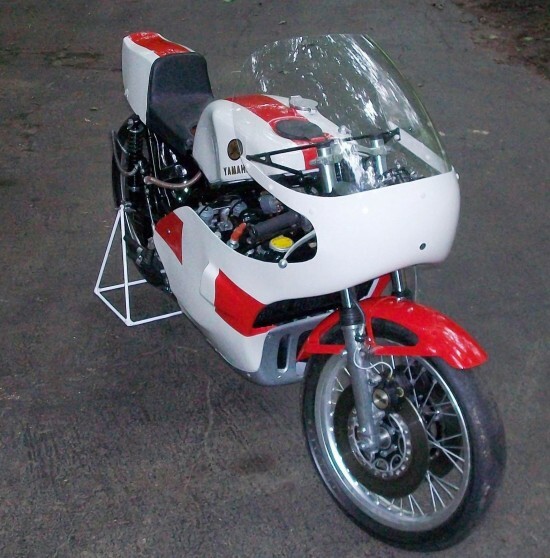 Interestingly, while the bike is listed as a 1974 TZ750, the 750 was actually introduced in 1975 and featured a sleeker look that eventually included a monoshock rear suspension that made the power more controllable and the bike overall less terrifying to ride. 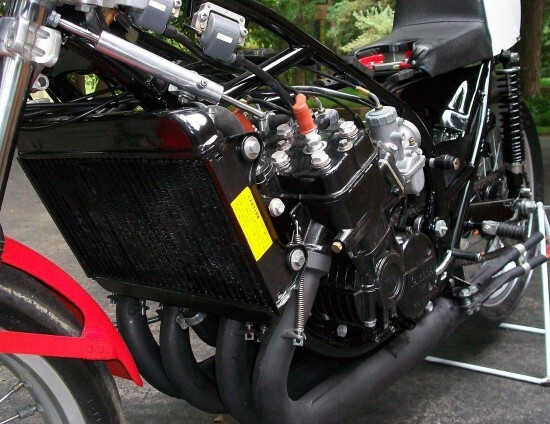 The early bikes were reportedly built up from a pair of liquid-cooled 350 twins to make the TZ700, which is supported by the seller’s mention of the “347cc” stamped into the side of the engine. Engine and Frame Number: 409 – 000191. 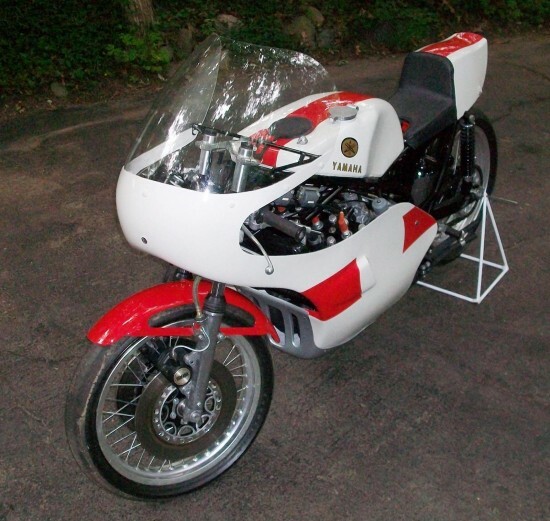 This motorcycle was imported to the USA (Los Angeles) in the first batch of (95) TZ750A models for the 1974 racing season, per the Yamaha Motor Co., Ltd. Shipping Invoice No. A-1547. It was initially raced by Denny Fox and Bill Betts and entered by Syl Kulaga of the “Twin K” Sport Center in Mt. Clemens, Michigan. The Yamaha has since been stored in temperature controlled conditions for more than 30 years. 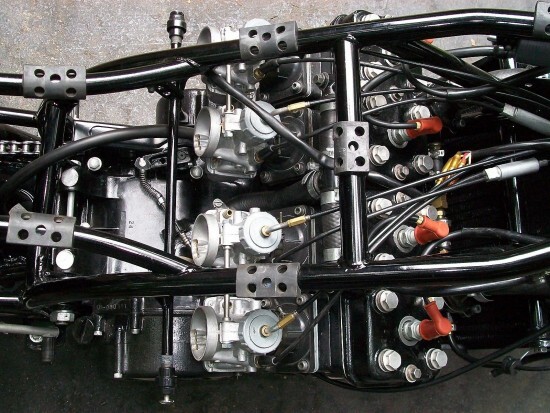 Matching numbers are stamped on the Engine and Frame, as shown in the pictures 23 & 24. The Cylinder Barrels have the following identification cast on the rear: “40900” on the Left side and “347cc 409000” on the right. The Mikuni 34SC carburettors are lightly stanped L38 on #1 and B3X on the other 3. The tires are Goodyear Motorcycle Road Racer 3.25-18 & 3.75-18. 1) The troublesome original exhaust pipe support band has been replaced by a compression spring and bracket design, which is shown in many of the pictures. The original support band is available with the motorcycle (Part Number 409-14715-02). 2) The front brake flexible hoses do not have a matching appearance. The fairing, fuel tank, seat, front fender, frame, swing arm and attaching black parts have been professionally painted to the highest standard. However, this is not a 100% restoration because some of the replacement metric fasteners are “non-Yamaha” and a few of the components are not perfectly plated. Also, the screen has some lower area imperfections which are concealed by it’s installation inside the fairing. The rubber grips on the footrests, handlebars, gear and brake levers and the seat cover are intentionally left unrestored to give the Yamaha a “previously raced appearance”. 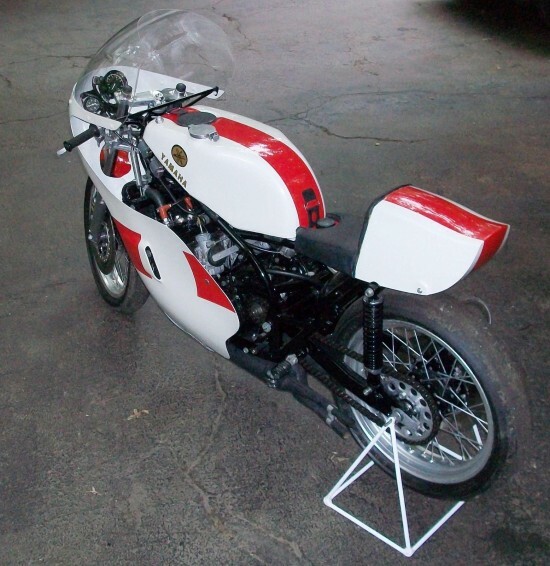 So while you won’t be taking this to the track without some work to get it running, it is otherwise impressively clean for a 41 year old motorcycle that was designed to do one thing and one thing only: go really fast. Racing motorcycles are generally not designed to look good up close and are used ruthlessly by teams and riders to win races, and the life span of most racebikes is very short. Considering that hard life, this bike looks beautiful and although it has been on display for most of its life, it was originally used in anger, and many race fans will pay shocking prices to get this close to such a legendary race bike. It would sell a lot faster if you put new tires on it, those are the baldest tires I have ever seen! Obviously converted to a track bike. Do you still have the original parts to make it street legal again?